When Samsung Galaxy S5 isn't setting the world on fire and Apple iPhone 6 hasn't yet released, it's high time for other smart phone developers to take actions to establish a place in the huge smart phone market. And Amazon is the very one that recently announces its flagship smart phone-Amazon Fire Phone. So how does Amazon Fire Phone fare against the powerful Galaxy S5 and iPhone 5S? Powered with an Android-based Amazon Fire OS V3.5 operating system, the Fire Phone comes with a quad-core Qualcomm Snapdragon 800 2.2GHz processor, and 2GB of RAM on its inside. Plus, touching on display, Amazon Fire Phone sports a 4.7-inch high quality LCD display, alongside a screen resolution of 1280 x 720 and an image density of 315 ppi pixel. 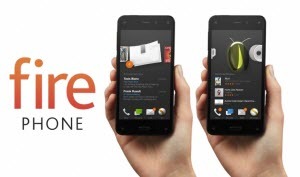 What's New in Amazon Fire Phone? Designed to aid users to "see and interact with the world through a whole new lens. ", Amazon Fire Phone features an eye-popping Dynamic Perspective, which is able to adjust a 3D image on the screen to match users' head position, pretty interesting, right? And it's mentionable that Amazon Fire Phone is also armed with something called Firefly, which can recognize printed phone numbers, email and web addresses, as well as 35 million songs, 24500 movies, TV episodes, art and magazines. With this compelling Firefly, you are able to send an email, make a call, and download music or movies on website just pressing and holding a dedicated button instead of typing it all into your phone. You see, its combination of a high speed, quad-core Qualcomm Snapdragon processor, above average high quality display, unique features ensures Amazon Fire Phone run smooth as butter and bring the user with an unprecedented multimedia experience. So assuming you are chasing for a smart phone to better enjoy movies, videos and music with sharpest image and no lag, this newly Amazon Fire Phone is definitely not disappointing. If you have already pre-ordered or bought this red-hot Fire Phone and want to convert your collected video to Fire Phone for playback, you need to resort to a professional yet reliable video converter for Amazon Fire Phone for help. 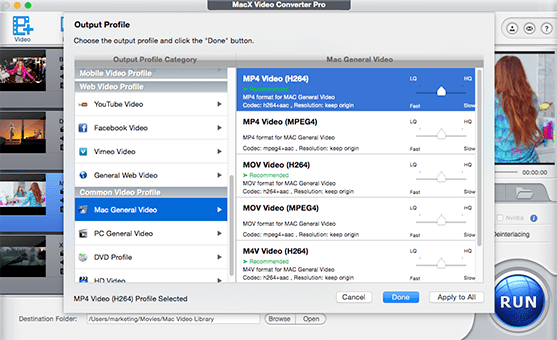 Here MacX Video Converter Pro is the best-ever video converter for Amazon Fire Phone you can count on, which enables you to convert any video to Amazon Fire Phone on Mac (Yosemite), like converting MOV, AVI, FLV, MKV, 3GP,etc to the Fire Phone friendly MP4, H.264 with 98% quality preserved due to its High Quality Engine assistance. Downloading this video converter for Fire Phone, launch it and then click the "Add File" button to import source video. To play back video on Amazon Fire Phone, please select "to MP4" or "to Android Mobile" to select the specific output format. Embedded with 420+video/audio codecs, this scrumptious Fire Phone video converter for Mac also allows you to convert among SD and HD videos including AVCHD to MP4, MTS to AVI, MKV to H264, FLV to MOV and more with highest possible quality for enjoyment. Note: Apart from converting video to Fire Phone on Mac (OS 10.10 included), infused with over 280 preset profiles for portable devices, this superb Mac video converter for Fire Phone is also capable to empower you to faultlessly convert any video to iPhone 5S/C, iPad Air/mini (Retina), Galaxy S5/Note4/Note 10.1, HTC One M8, Surface Pro 3, Kindle Fire, Huawei Mate 10(Pro) and more handheld gadget in purely several mins. Step 4: Start to Convert Video to Amazon Fire Phone on Mac. Press the "RUN" button to begin video to Amazon Fire Phone conversion. You can view the conversion progress or cancel the converting process at anytime. Tips: This stellar video converter for Amazon Fire Phone also provides a seamless solution for those who'd like to download and convert YouTube video to Amazon Fire Phone accepted format for offline watching on the go. Certainly, in case you also have a yen for record on-screen videos, this world-renowned Fire Phone video converter can also cater to your needs to quickly record on-screen movements like tutorial or game walkthrough, etc. so as to let you upload them to YouTube, Facebook, Metacafe for sharing.